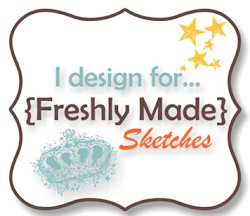 We have a new sketch over at Freshly Made Sketches for you and this time it’s my turn to design the sketch. I’ve used some new Stampin’ Up! goodies from the upcoming Stampin’ Up! 2017-2018 Annual Catalogue for my card. I love it when I have new toys to play with! The flower I’ve used on my card is a sticker from Eastern Gold Vinyl Stickers – they’re so easy to use and so effective. I then added a gold sequin to the centre of the flower to add a little more bling to my already gold accented card (really, you can never have too much gold and bling!). The flower is mounted on a circle cut with Stitched Shapes Framelit Dies and this has been mounted on a Lace Doily. 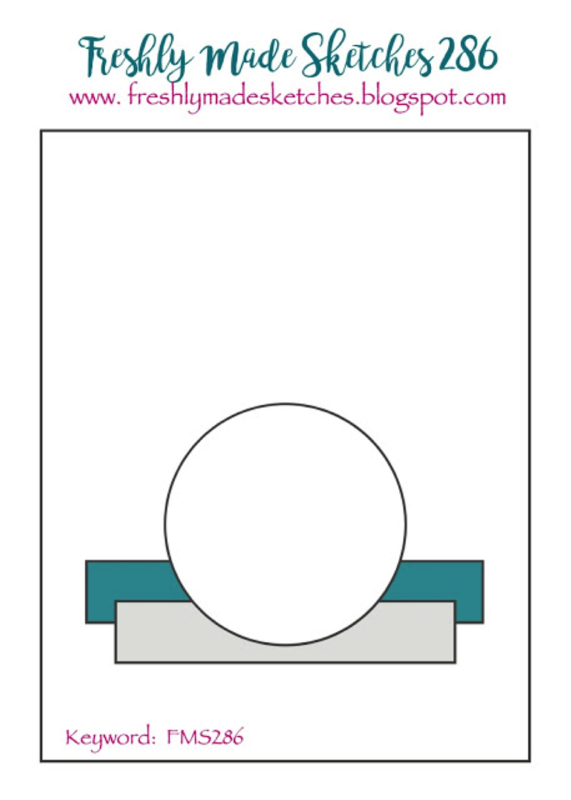 The designer series paper I’ve used is called Eastern Palace Specialty Designer Series Paper. Oh my goodness! It’s so pretty! I added a strip of thin gold ribbon and added one of my new gold tassels from my new Mini Tassels Assortment pack. For the background of my card I stamped the ink splatters from Swirly Bird with my versamark and then heat embossed them with Gold Embossing Powder. I then created the sentiment in the same way. The little Hello sentiment is from a stamp set called Eastern Beauty. This stamp set matches Eastern Medallion Thinlits and Eastern Palace Specialty DSP. We would love it if you could play along with our sketch. Head over to Freshly Made Sketches and be inspired by the Clean Teams gorgeous cards. Wow! It’s definitely a super great sketch Narelle! And you turned it into such a gorgeous card . There are so many wonderful elements.! This is gorgeous! Beautifulky detailed! I haven’t figured out how to use this set yet! Love your sketch this week! Thank you Narelle for putting a different slant on this stamp set. 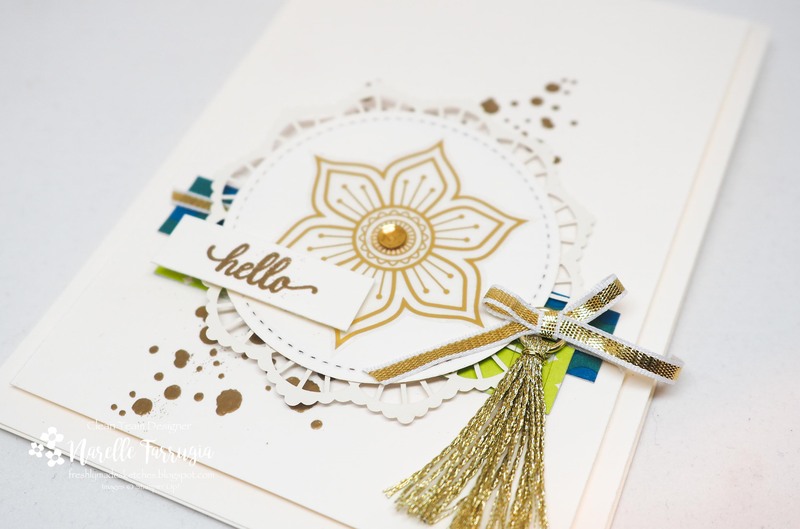 Love how you have used the dots and the embossing them really makes them stand out …. That little tassle is just gorgeous and works beautifully with the other elements in your fab card. Thanks for a great sketch! This is such a beautiful card Narelle! I love that suite and the gold is so elegant! Thanks for a great sketch this week! What a great card with this wonderful stampset! Wowzer! This has got your signature layers but in a whole different way. I love how you’ve tucked some bold colors behind the white layers and then layered on all that white with gold accents. A classy CAS card for sure. Thanks for the great sketch! You have really knocked this sample out of the park. Beautiful way to show the new suite! Thanks so much for a great sketch this week!